Six women and five men have died after floods hit the Raganello Gorge in southern Italy. The civil protection department said 23 people had been rescued after 8ft (2.43m) of water filled the gorge following heavy rain. Tourists can visit without a guide, making it difficult to know exactly how many people were in the canyon when the floods hit. 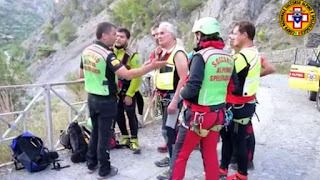 "This gorge filled up with water in a really short space of time and these people were catapulted out like bullets," said Carlo Tansi, head of the civil protection department in Calabria. "They ended up some three kilometres (two miles) down the valley." A Dutch hiker, quoted in local media, added: "A real avalanche of water came unexpectedly. We did not have time to do anything. I was lucky, it was an incredible thing." The level of flooding - which came after heavy rain - is unusual for the season. Lucas Frazsese, from the alpine rescue team, said: "The wave of flooding of the Raganello stream happens often in the winter, but it has never happened in the summer, when the stream is very popular among tourists." Raganello Gorge is very narrow and high, making flooding especially likely and extra dangerous.